Midis are my new obsession. More specifically, 50s inspired circle skirts. I can't get enough of them! If you follow my on instagram (insert shameless plug here) then you already know that. I love the way they look— they're so feminine and simple. They seem to be very popular these days, too. I've seen some cute ones at Zara and also Forever21. The one I'm wearing is actually a DIY (they're super easy to make). There's still a brisk wind circling around (and talk about the rain this week), so I paired the skirt with a chunky-ish knit sweater from Forever21. The crop makes it perfect for high waisted skirts. The shoes are an awesome find from Walmart. They come in a few colours (I picked up back and blue), they are ridiculously inexpensive, and they're incredibly comfortable! How can you say no? I should note that the sizing runs a bit large (I'm typically a 7, but I had to size down for these). Have you checked out my brunch series? Here's the latest "episode." We've just kind of been winging them as we go along, so feedback is welcome :). Ps, if you want to see this outfit in motion, check out the video because I did a quick ootd. You look GORGEOUS! love this outfit and wow good for you for making that skirt, as much as my mom is talented in that area I am not haha! I've been looking for one though that isn't too expensive. Also sadly since I have flat feet I couldn't get those shoes :( they just wouldn't fit me right and I couldn't walk in them, le sigh. How did you DIY that skirt? It's beautiful! I love the whole outfit actually. I've always avoided crop tops but it is perfect for a high waisted skirt like this! Thanks girl! I impressed myself when I made it haha I just had a vision in my head, started cutting / sewing and voila! The skirts that I've seen were pretty pricey— that's what inspired the DIY, really. I bought a skirt from asos and realized how easy they probably were to make. So pretty! 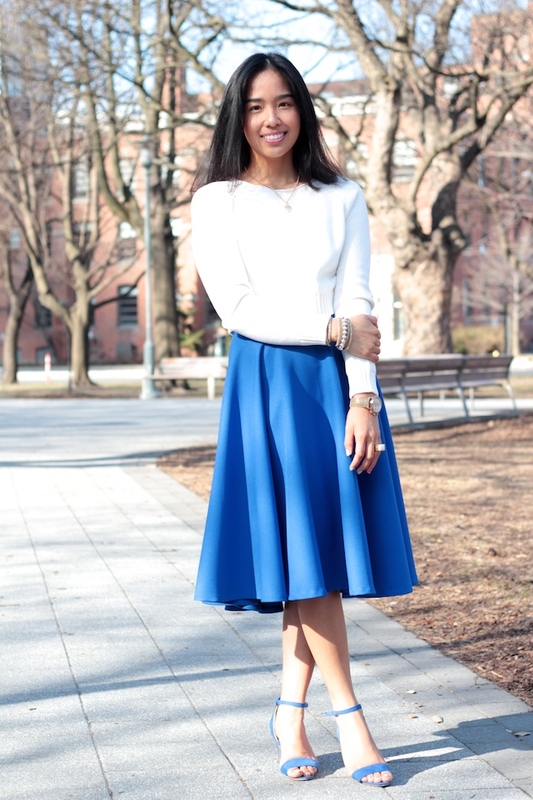 I'm not sure I could pull off a longer skirt myself, but this looks great on you! I love your shoes and skirt! The second picture looks gorgeous! Wow love those shoes and the skirt! I can't pull off a midi skirt yet but I'll keep experimenting! Just made various social media accounts too so if you'd like to follow me in any of them, I would really appreciate it! :) I just followed you on instagram, facebook and twitter. You really got me hooked that azure blue and of course, those darn cute sandals as well. I wore them in a recently ootd video (http://goo.gl/zxxIPK / respond with shameless plug) and I've passed it one to everyone who'll listen to me that they are really the perfect easy summer sandal. This look reminds me that I need to go fabric hunting from something cute to make a midi for myself. Love the look but that style just takes so much fabric!